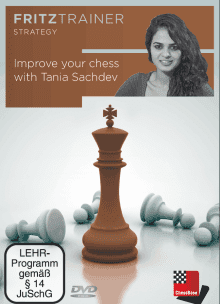 This interactive DVD features Indian IM Tania Sachdev presenting lessons based on 15 of her games in ChessBase video format (with a viewer program included for those without ChessBase software), along with a series of 10 training positions/games at the end of the DVD which are fully interactive. In both cases you can access the games in the database for further exploration or review after the video portion is done. The DVD contents are focused exclusively on middlegame play. Sachdev at various points comments on the importance of knowing opening theory, for example in the intro clip when emphasizing that you should at least know what types of positions you want to end up playing. She does not discuss the opening phase of her games much, but a lot of the examples come from the early middlegame and show that "just playing chess" can still be important in a tournament game. During the 15 video annotated games, Sachdev does a good job of using the highlight tools to indicate things like key squares and threats, as well as asking the viewer to pause the video at critical points to think about possible continuations. This type of interactivity is naturally enhanced in the final section of 10 "questions" which are presented similar to typical tactics trainer positions, with you making your chosen move on the board. However, the instructional value is enhanced by Sachdev not only explaining the best move when you make it, but also discussing key variations (if you choose one of them) and/or specific elements to look for in the position (if you get it wrong). With several of the games, there is more than one "question" position in them, which I found especially valuable, as it let me see how a game can progress through multiple decision points and longer tactical sequences, which is more like participating in an actual tournament game. As a Class player, I found the DVD helpful and enjoyable to use, as Sachdev usually explains her concepts clearly and focuses on a couple of main points in each game. If you are looking for something more structured and theoretical as part of your training, the annotated games approach might frustrate you, but from a practical standpoint I think the DVD works well; it's very much like having her available for a series of lessons. There could have been even more interactivity, but the product shows off some of what can be done to enhance your training beyond simply watching a video. Very helpful review. Thank you. I'm officially addicted to these Fritz Trainers, which can be an unkind condition for the pocket book.